Sometimes, it hard to imagine that the people in really old black-and-white photographs actually lived in a colorful world. Yes, their music sounds funny to modern ears (and their humor often doesn’t! ), but they found ways to have a good time! Maybe hockey fans in the early days of the Stanley Cup weren’t making as much noise as the fans in Chicago at the Madhouse on Madison the other night, with their amped up, piped in sound explosions, but they weren’t sitting on their hands either. A few years ago, I was reading old newspaper stories about the 1903 Stanley Cup series between the Montreal Hockey Club (usually known now as the Montreal AAA) and the Winnipeg Victorias, played between January 29 and February 4 of that year. A story in the Montreal Herald referred to the fans amusing themselves by shouting out “scraps of songs.” Often, they broke out into In the Good Old Summer Time, which came out in 1902 and quickly became a hit. It was decidedly the dead of winter in Montreal, but the weather was unusually mild that day and the natural playing surface was soft and slushy. “Was it a reference to the conditions of the ice is a question we must leave to the gentlemen who sang it,” said the Herald of that song. “Who drove the Spaniard back to the tanyard? Among the many items of my wide-but-not-very-deep historical interests are Teddy Roosevelt and the Spanish-American War of 1898. Given the timing, I figured it must have something to do with that. But what? 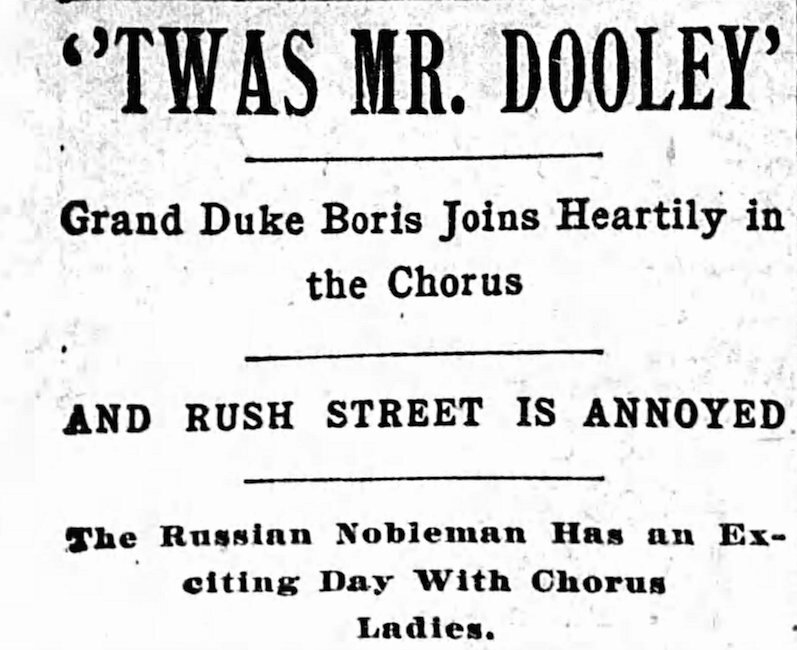 Turns out, Mr. Dooley was a fictional character created by a Chicago newspaper writer named Finley Peter Dunne around 1898. Mr. Dooley – according to Wikipedia – “expounded upon political and social issues of the day” with sly humor. (Think Jon Stewart, or Stephen Colbert.) Mr. Dooley became so popular that Dunne’s columns were soon syndicated across the United States. By 1902, he’d published five Mr. Dooley books. Teddy Roosevelt was big fan. 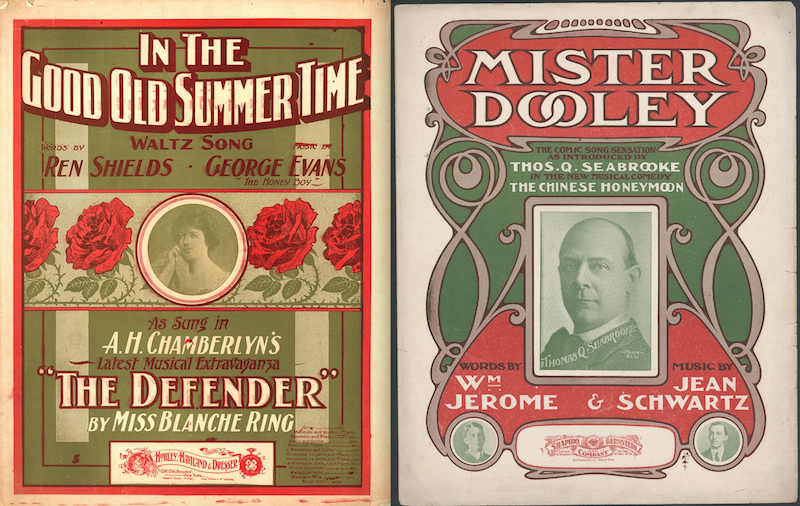 That same year of 1902, the American songwriting team of William Jerome and Jean Schwartz put Mister Dooley to music. Though it seems to have nothing to do with the plot of either play, the song was added to the Broadway staging of a 1901 London show called A Chinese Honeymoon when it opened in New York on June 2, 1902. It was also included in a stage production of The Wizard of Oz which opened in Chicago two weeks later and had moved to New York earlier in January of 1903. Mister Dooley was so popular, it sold over a million copies. It might not have the same celebratory quality as Chelsea Dagger by The Fratellis, which has become a huge hit with Blackhawks fans in recent years, but Mister Dooley was definitely an early earworm. Think “Who Let the Dogs Out / (Who, Who, Who, Who? )” only a lot less Calypso-Hip Hop and a lot more Tin Pan Alley. Despite the fact there were already ten verses, each with a different version of the chorus, people seemed to enjoy writing their own new words to suit various occasions. And everyone was singing it; from school kids, to advertisers, to the Grand Duke Boris, brother of Czar Nicholas II of Russia, accompanied by a bevy of chorus girls while in Chicago in the late summer of 1902. And what did Mister Dooley sound like? Well, have a listen! Stella, I know you’re a lot more familiar with this type of music than you want to be! Wonder if it was set to music?